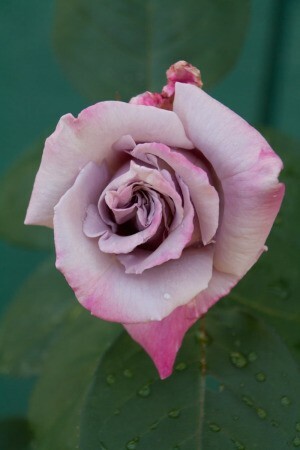 If you select a cutting from a grafted rose, you should get a clone of that rose. You should not get any characteristics of the root stock. On rare occasion, a grafted rose will send out a shoot from below the graft union. Unless removed, this shoot will grow along side the grafted rose. 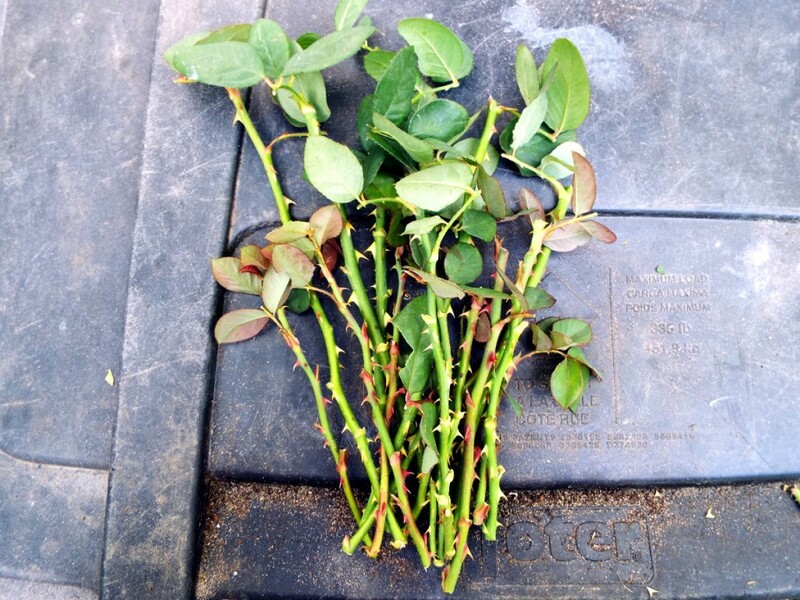 Cuttings taken from this shoot will give you a clone of the root stock and not the grafted rose. As a child, I rooted my first rose by randomly selecting a 5 - 6 inch stem from the parent plant, burying the bottom third in the ground and covering the top two thirds with a mason jar. Six weeks later, I gently lifted the stem from the ground and saw several 1 inch roots at its base. This simple method does work some of the time, but you can increase you chances of success if you follow a few simple rules. Roses can be rooted over winter or any time during the growing season. Here, I am talking about rooting cuttings during the growing season. The ideal time to root cuttings is during the months of June and July. Have your rooting medium ready prior to selecting your cutting. Commercial growers usually use sharp, sterile sand. I prefer to add an equal amount of milled sphagnum. The medium is put into a pot, filling the pot only one half to two thirds. The empty space left will add 'closeness' to the atmosphere, which will aid the rooting. The ideal cutting will be neither new and tender not old and woody. It will be what is termed 'half hard' or 'half woody'. Select a 6 - 8 inch stem that has flowered and the bloom is spent. With a sharp, clean knife, remove the cutting from its parent stem. The cut should be made where it joins the stem and should include a bit of 'heel' from that stem. Remove the spent bloom and stem down to the first pair of leaves. Remove all leaves except that first pair. If they are very small, leave the second pair, as well. Dipping the cutting in rooting hormone is not necessary, but it will speed the rooting time and help produce larger roots. Also, most rooting hormones contain a fungicide which will help prevent damping off. I do not advise using honey as a rooting hormone, due to its propensity to grow bacteria. Immediately after preparing the cutting, insert it into the medium up to and including the first node above the base. Place the pot where the cutting will receive bright light but no direct sun. Wet the medium once. Then, during the rooting period, keep the medium moderately moist, neither wet nor dry. The ideal rooting site will have a close atmosphere with good air circulation. Do not cover the cutting. Do not mist the cutting. Doing so will increase the chances of losing the cutting to soil and airborne pathogens. Don't be alarmed if the leaves drop off the cutting. It will do no harm. Remove any fallen leaves so as not to provide litter which will only cause problems. The best evidence of a successful rooting is new growth, which should appear within six weeks. If you are brave and don't mind risking the cutting, after six weeks you can gently lift the cutting from the medium to check for roots. Keep the rooting in the same pot until the following spring. Then remove the cutting from the pot along with all the medium intact and plant in it's permanent location. I am particularly proud of the rose in this picture. I rooted it from a cutting last year. What you see here is its very first bloom. 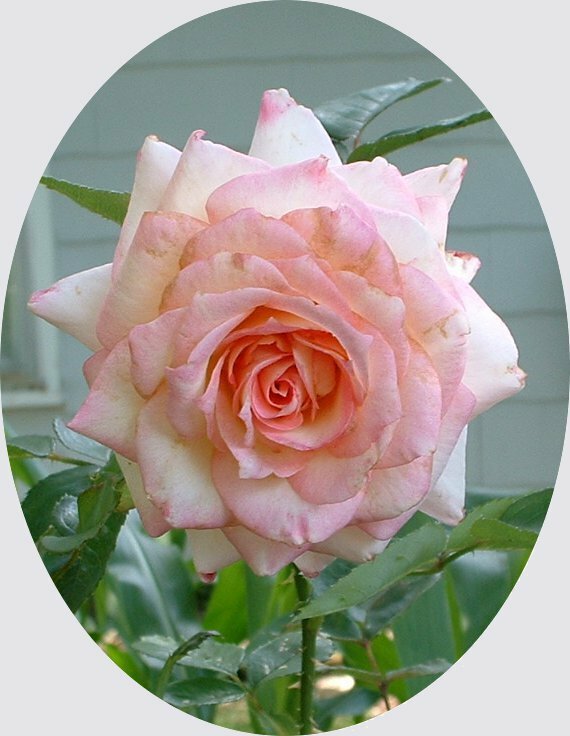 The name of the rose is Kordes Perfecta. My husband's grandmother would always take a cutting from a healthy rose bush, stick the cutting cut side down in the ground and cover it with a quart size canning jar. She kept it covered until it began to show growth. You have to do this in the spring, summer or early fall (at least in areas where you receive snow). Worked like a charm every time. The experts advise us to select a piece of half hard stem about six inches long. While this is good advice, it isn't written in stone. If you can't get that desirable six inch piece, take whatever you can get, even if it's a one and a half inch 'nubbin'. If it is healthy and given proper treatment, it will root. In November, cut a blooming rose to where you will have a Y, then bury the stem including the Y. Then put a quart jar over the rose, sealing it into the ground. 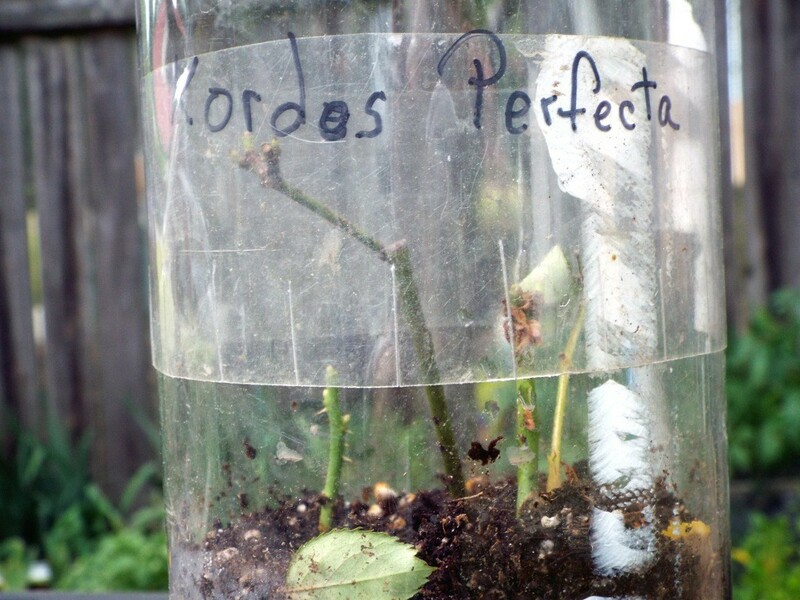 Remove the jar in April and with luck you will have a rooted rose bush. Have you ever tried cloning rose bushes? If you have with out success, here is a simple tip that will get you started on your way. I put my rose cutting in a porcelain pot about two inches wide at the top, and an inch and a half at the bottom, and about 3 1/5 inches tall. I also threw in a few pinto beans. This took place about 5-6 days ago. Is it possible for me to start over and do the process in the ground with the same cutting? It hasn't taken root, although the beans have. Please let me know if I can save this rose. Can I keep rose cuttings in water all winter or should I plant them now? They have started rooting already. Should I bring them inside or plant them? Do not plant outside until all danger of frost has passed. Keep them in a perlite soil mix. You don't say what zone you are in. In Pittsburgh because we seem like we have 6 months of winter and 6 months of summer, I only planted my rootings in what is now our summer (late May/early June--when there is no danger of frost OR excessive rain--which doesn't leave much time these days because our weather is horrid!). I have kept my rootings inside in a sunny window until then. I always get them "used to" the outside, but leaving them outside during the day for a few days (in the spot where they will go) and then bringing them in at night...until I do the final planting. Good luck!! This is great way to have a lovely garden for a very little price!! Mine lived inside just fine!! I asked around to my TX friends and the consensus is they have all had luck planting clipping grown bushes between February and May...with the average being late March/early April!! Happy planting!! Enjoy your beauties!!! I want to grow rose bushes from a couple long-stem roses. The stems are relatively hard and thick, but they are still green. While they were in a vase, they started growing new leaves. So I took then out and cut them into 5-10 inch cuttings. Each cutting has at least 3 buds. I mixed a solution: 3 cups of water and a tablespoon of honey. I bruised the cutting bottom, about an inch and left it in the solution for about 30 minutes while I prepared the potting soil. I do have drainage holes in these pots (made from water bottles) and I also used a clear box as a mini greenhouse for the cuttings. Oh yah, I watered the cuttings with the remaining solution. Now I am kinda regretting it because I fear that the cuttings with rot. The cuttings are in a relatively bright place, but not in direct sunlight. Is there anything I have done wrong? Anything I should look out for? Or what can I do to fix my mistakes? Your question reminds me years ago of when I asked this question of a florist and was told it is not possible. I hadn't thought about that in years. That was way before Google, of course. Now with Google, I am learning it is possible. Then I learned there could be legal implications with this as you can grow them, but if they are some special breed or style that is patented, you can't sell them. How sad is that that there has to be posts telling us that. Seriously....sometimes Google just has WAY TOO MUCH INFO (TMI on steroids). I did not use roses for my wedding, but if I had, this would have been such a cool idea!! Post back with updates! Can I get out my plants out from the green house after 50 days since they were planted from cuttings? It would depend if they have enough root growth on them, and if the temperature is ok for them to be outside. They need to have stable roots. Make sure you used rooting hormone. Will rose stems root in water? It has been my experience that the rose stem always rots when trying to root them in water. Most professional growers use (or at least, use to use) sharp, sterile river sand or an equivalent. I don't see why clean play sand wouldn't work just as well. I usually just stick them in the same soil the parent plant is growing in and cover with a quart mason jar. How do you grow roses from cuttings? Go to Google and type in the same question! My great grandmother used to cut the roses at the base of the stem where it meets the main branch. dig a hole and put the rose into the hole and top with a jar, and then water. Keeping it damp. She never purchased a rose bush. Any given to her were always done this way to expand her garden. How do you start a rose from a clipping? You can try it, but be prepared for disappointment-the plant you get from the cutting may be very different from the plant you took the cutting from. That's because the rose growing in your garden is usually a plant that has been grafted-two plants to form one with desirable characteristics like growth, colour, drought and disease resistance, etc. If there is a man sized fist looking knob down at the bottom of the plant where the stems grow from, you have a grafted plant-this means that your cutting may grow up to be either showing characteristics of any of the plants used to form the final plant. Take a cutting from above the graft, make sure it's around 6-8" but no longer, and that the stem is green and pliant; make your cut about 2" below a very immature bud or leaf start, then use your thumb to rub or pinch off the bud or leaf start to open a path for root formation-your roots will form there and also at the cut. Dip the cut in RootTone or a similar starting hormone powder, getting a good dusting on the cut. Poke a hole with a pencil in a small clay or peat pot that you've filled with a rooting mix-buy a small bag, or make your own (ingredients for home made rooting soil are becoming harder to come by due to restrictions and resource depletion-check your library for alternatives, but usually sand, perlite, and vermiculite are used). Insert your cutting into the hole making sure the cutting is in the pot deep enough for the rubbed/pinched bud/leaf area to be under soil. Water the soil to even dampness-don't let the soil dry, but don't over water, either. Aim to keep the soil evenly moist. In a week or so, if your cutting is still green, and looks healthy, you probably have roots. In another week or so you can transplant it to the garden or pot. Expect blooms the following year. If you succeed, please post pics of the 'parent' plant, your cutting during the rooting wait, and the first blooms you get from it. 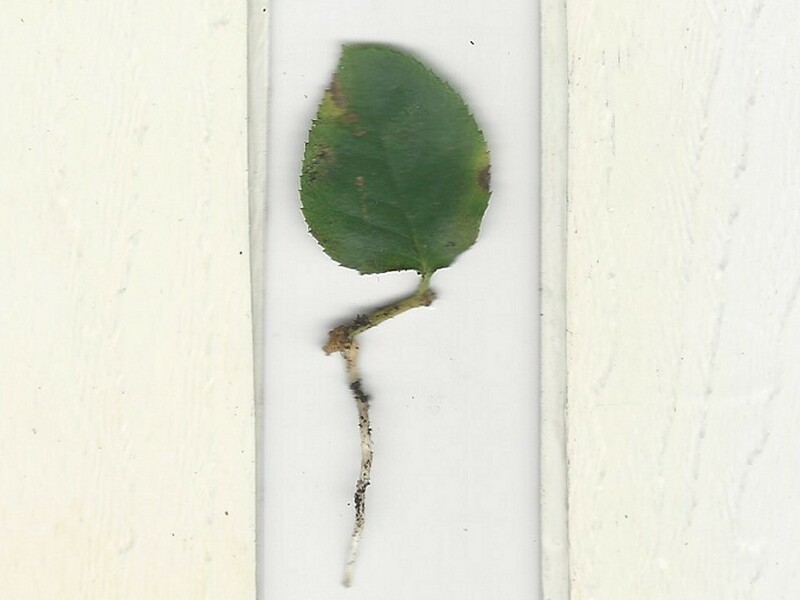 I took a piece of wild rose bush that I would like to have root so I can plant it. How would I go about doing this? Roses are frequently started from cuttings. Sometimes a leaf from a plant can be used to propagate a new plant. This is a guide about rooting a single rose leaf. It might be worth a try to see if you can make multiple cutting from longer rose prunings. If they root you can have several of your favorite bushes in the garden. 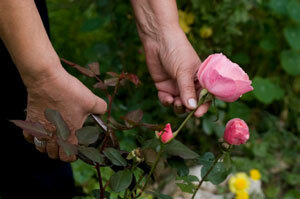 This is a guide about taking multiple cuttings from a rose bush. I have cut some healthy stems off of a rose bush. I have already planted them where I want them to take root and grow. Every website says to put a jar on top of each stem for a greenhouse effect. How long do I need to leave the jars on them? I don't want to suffocate them. There are many more healthy stems that need to be planted, but I want to try and do it right. Please help! I have good luck rooting almost anything, just cut off the new growth of a bush, stick it in soil in a pot in the shade. Keep damp, it will be ready to transplant the next spring. I have rooted a lot of roses like this, good luck. How do you start a rose bush form a cutting? Tips from the ThriftyFun community. My Mammaw used to take a cutting and just ram it in the ground where she wanted it to grow and would place a quart jar over it and leave it there until new growth begins. She would have some fail, but not too often. Her thumb was greener than green. She always lived in East TX, but I'm sure no matter where you are, if the cutting is getting plenty of sun, and the soil is moist to begin with, it should take root. My mom could start rosebushes from cuttings, though I never tried, her's sure grew! Be sure to get a cutting with a bloom and five leaf fronds. Plant three fronds, leaving two above ground, pinch off the bloom and cover with a glass jar until new growth. Very similar to the previous post, just be sure of the bloom part if you want to be sure of the bush also blooming. I have always used a cutting to transplant roses and the way I do it is to get a cutting just under the joint and slit it and then put a pinto or some kind of bean and dip it in Rootone and plant. I always said a verse, "If you grow, you grow. If you don't, out you go" and it did grow. The bean is what takes root first and it helps to give the twig a chance to take root. I was taught to take the cutting, dip it in rooting hormone, and plant in a coffee can filled 3/4 way with damp sand (you can do several at once in the same can). Cover with the lid and wait until rooted. Just make sure you don't bake the cuttings in a hot place. Not sure if this would work as well with the newer plastic cans. I picked a beautiful rose at my Mom's house and stuck it in the ground in my yard a few years ago and now I have one of the most beautiful rose bushes any where! Just cut you a piece of the bush off at a joint and put it in some good soil. I started a few roses from stems, but when I remove the cover, the leaves dry out and I lose the plant. How long do you leave the cover on?